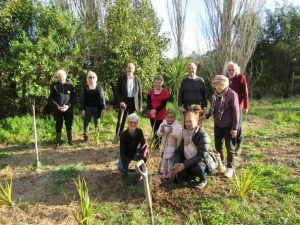 To close out the 2018 winter planting season STEPS held a ceremonial planting of some kahikatea in the new wetland. Roy Clements (STEPS Patron), Peter Haynes (AELB Board Chair), and Wendy John (Friends of Oakley Creek Chair) all spoke and Tanya White gave a karakia. Five trees kindly donated by Friends of Oakley Creek were planted. 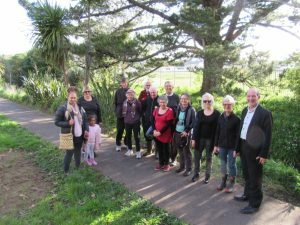 The group joined in singing a waiata by Dr Hirini Melbourne: E Tu Kahikatea. (Here are the words and music https://www.facebook.com/notes/hirini-melbourne-syd/ngaa-waiata/163807221664/?hc_location=ufi & … https://www.youtube.com/watch?v=jM1JzPClXDI). Kia ora tatou – thank you for coming on this 1st day of Spring – a very special day. Ko te ra tuatahi o Mahuru, te ra tuatahi o Koanga.